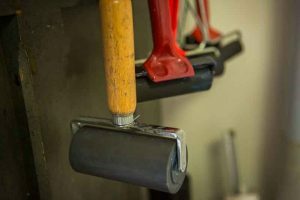 Home » Part 1: What is Printmaking? Printmaking is a mystery to many people. It is a fine art form in its own right. Just like any other artform, it requires practice, patience, skill and persistence to master the craft. I am a proud member of the Maleny Printmakers. 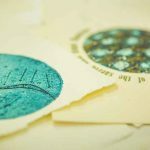 We are a small group local (Sunshine Coast) printmakers, promoting the beauty and variety of printmaking in all its forms. 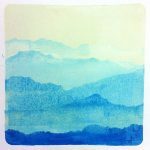 Printmaking in Australia is experiencing a resurgence and Maleny Printmakers are participating wholeheartedly in this renaissance. 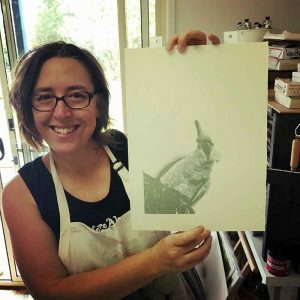 Sonja Georgeson, one of the founding members of the Maleny Printmakers, wrote a series of articles about printmaking, editioning and terms. We use this information in our exhibition catalogues to help people gain a greater understanding of and appreciation for the craft of printmaking. The art of printmaking involves the creation of images, generally on paper (but also on fabric, clay, plastic or other surfaces) by various techniques of ‘multiplication’. These images are considered original works of art, even though these prints can exist in multiples, because they are created by the hand of, or under the direct supervision of, the artist. When a print is produced in multiples, it is called an ‘edition’. There are several different types of ‘editions’. Limited Edition indicated that a specified number of prints have been produced of the one image. An Open Edition means the artist will produce their print in any quantity they choose. Prints can also exist as a unique-state (one-off) print, called monotype or monoprint. Editions can also consist of prints that present as ‘variations’ within the edition, called an Edition Variable. To many people, the word ‘print’ suggests mechanically mass-produced commercial products, such as books, posters, newspapers and textiles. Here, the word ‘print’ refers to the original creation by an artist who, instead of using a paintbrush or pencil, chose printmaking tools to express themselves. Each technique has its own distinctive style and qualities, imposed by the tools, materials, and printing methods. Printmakers may work with several different methods and media in their practice. It is not uncommon for printmakers to use multiple techniques in one piece or edition. Part of the attraction of printmaking is its varied nature. It is an artform that has been around for hundreds of years. Lino cut – I recently filled a sketchbook with my reductive linoprint process photos to help show people what linoprinting was. Click here to see how I shared my favourite printmaking process in a book. What is the difference between a reproduction and an original print? A commercially printed or photographic copy of an existing artwork is a reproduction. These reproductions may also exist as artist-signed Limited Editions and carry value in their own right, but these reproductions are not to be confused with original hand-printed work. An example of this in my own with is the giclee reproduction of my Watching reductive linoprint. A printmaking print is a multiple original. The artist created an image on wood, stone, metal, lino or screen, then produced their final print (or edition) within the possibilities and limitations of that technique.